... a change I made was to go back and took out the middle band of "Jolly Holly" I had stitched in the trees and restitched using the called for DMC green... and went back to the first house and un-stitched the called for dark green DMC from the top and bottom and restitched with CC's Steamed Broccoli, the floss I am using for the pine bough decoration under each house. There is only a single tree left on the bottom row which I will stitch CC/DMC/CC so there is continuity. I kept looking at the "Jolly Holly" and it just didn't sit right - the colour was on the blue side and all the greens in this piece are on the yellow side..... I have looked ahead and see some other changes I am going to make, but will talk about them as I get to each house. It turns out really well!AriadnefromGreece! Looks good - so festive! You are really making progress on this piece! It is looking wonderful! it's looking great. it is nice to change colors a but. That is going to be a wonderful Christmas design. Do you have a favorite "Pine green" color? 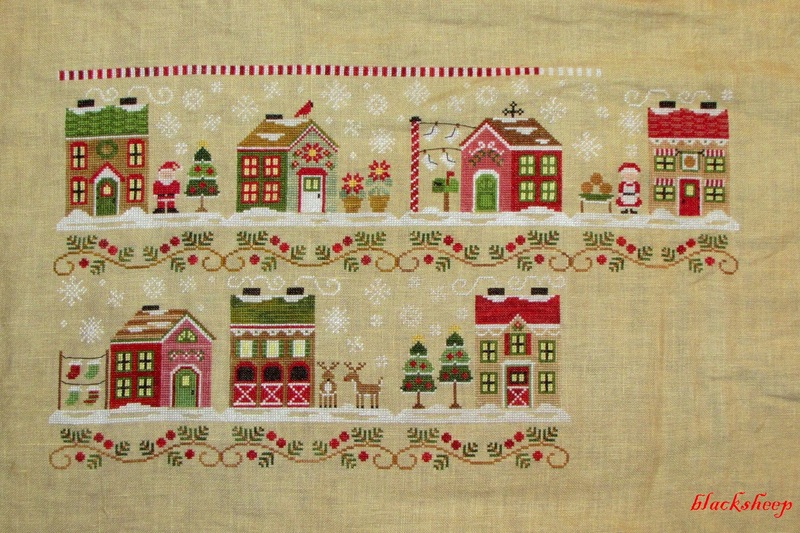 I am always looking for one when I do Christmas designs and I really don't have a favorite. It's really coming along. The colors in this one are very pretty.....you've chosen well! Looking good! I'm enjoying watching your progress.